Pumpkin Puree to Save the Day! As autumn rolls around every year, we start to notice an abundance of one particular vegetable: pumpkins! While we as pet owners may enjoy pumpkin pie or pumpkin spiced coffees, but did you ever consider your pup might enjoy this super squash as much as you do? Pumpkin puree can be a beneficial treat for your dog or cat. It is loaded with fiber that aids your pet’s digestion. Pumpkin puree will absorb excess water and can be an effective treatment for diarrhea. The high fiber content is also helpful in keeping your pet regular and treating constipation. In cats, pumpkin puree can assist in moving fur balls through their digestive tract (and into the litterbox!) rather than being hacked up onto your carpet. Along with treating various tummy troubles, pumpkin is also packed with vitamins! Vitamin A in pumpkins will help promote healthy vision. It has plenty of vitamin C for immune health. Dogs who have joint problems will also benefit from the boost in vitamin C, as their bodies consume more vitamin C than they are capable of producing. To keep your baby looking shiny and beautiful, pumpkins are also a great source of Zinc. If your fur baby is a little too chunky, pumpkin puree can be the key to weight loss. Due to its high fiber content, pumpkin puree can help your pet feel fuller, while actually consuming less calories! Combined with exercise and appropriate feeding amounts, pumpkin puree can help you reach your goal for your pet’s weight. Pumpkin puree is an affordable and easily accessible supplement to your cat or dog’s food. Be sure that when you are shopping for your pumpkin puree, you buy the plain can of puree. Pre-spiced, sweetened, or “Ready for Pie” purees are meant for human consumption only. Consult your veterinarian to find out how much pumpkin is right for your pet, as serving sizes will vary depending on the size of your baby, and your goals. Overall, pumpkin puree can be a very helpful tool. Whether you are looking to settle an upset tummy, pack some vitamins into your baby’s diet, help them lose weight, or just offer them a special treat, pumpkin can be an advantageous part of your pantry! Officials have warned about a recent increase in cases of the highly contagious H3N2 Canine Influenza in Georgia. This flu is highly contagious and can be spread with coughing, barking, and transferred by infected objects. Vaccination is recommendation is for all dogs that are frequently around other dogs, dog parks, boarding, grooming, etc. It is also recommended for older and immunosuppressed dogs. ​ALL DOGS ENTERING WAG ATLANTA MUST BE VACCINATED FOR CANINE INFLUENZA H3N2. Though we have not seen any cases here at Wag Atlanta, we want to keep your pets as safe as possible. We realize it is an inconvenience and expense and we know you have a choice about where you take your pet play and stay. We appreciate all our pet parents who know our priority is your pet's health and happiness. For your convenience, we are offering the Canine Flu bivalent vaccine at Wag Atlanta, better protecting your dog from both the H3N2 and H3N8 Canine Flu. This vaccine requires two doses 2-4 weeks apart. Your dog would not be considered vaccinated until the 2nd vaccine. Annual revaccination requires just one dose. ​If you are selling you home, no doubt your realtor has given you a list of things to do around the house to create a clean slate for potential buyers. Top of the list includes you and your family not being present during showings, including your pets. Potential buyers want to view the entire property, including whatever room or area your pet is staying. Give them a full access pass! Your dog will be stressed with strangers coming in and out of your house. This stress not only will affect your pet, but can affect your showing. Some dogs will have accidents when they are stressed. This reaction or barking is not welcoming. Curious buyers will open a gate to see the entire property, potentially letting your dog or cat out of an enclosure or fenced yard. You can be held liable for your pet biting someone on your property. Your dog or cat may not normally be a biter, but with strangers coming in your home and possibly interacting with your pet they can behave quite differently. Don't take this risk! Some people are scared of dogs and will not go in to a property with one on site. So, what do you do? Take your pets off site during showings. Take them for a walk or leave them with a friend. If this is not an option for you, consider a local day care or boarding facility. Your pet can be socialized and play with friends while you sell your home. Our service is recommended by many local realtors giving their clients flexible hours and competitive rates. We have a fantastic day care and boarding program. Dogs will enjoy their stay with us and you will have a piece of mind during your transition. What is Socializing my Dog? They are able to read other dogs body language, and react appropriately. If a dog initializes play with your dog, they are able to tell that they are playing and acts accordingly. They will also learn when another dog does NOT want to play, which can be equally important. They are able to tell when a human is being friendly and act friendly towards them. They don’t cower or bear their teeth in fear. When should I socialize my Dog? As soon as possible! The younger the dog, the easier and more effective the process will be for them. If they’re not a puppy anymore, then start right now! The older they get, the more set in their ways they will be and it becomes more difficult for them to learn new things and adjust to different scenarios. How do I socialize my Dog? Getting them around as many other people, dogs, and places as possible will help socialize your dog! The more dogs that your dog meets, the better they will be at reading other dog’s body language. This means better at greeting new dogs, better at playing with other dogs, and that your dog will have more confidence overall. How can Day Care help? Wag Atlanta's Day Care program groups dogs based on size and temperment. The groups get tons of time together, giving them endless opportunites for them to make new friends. New dogs are being added to the group all the time, creating more chances for them to hone their skills. The dogs in the group will "correct" any inappropriate behaviors from a a new dog. The new dogs will catch on quickly and become comfortable and social! It is wonderful to see them bonding, learning, and growing. A social dog is a happy dog! 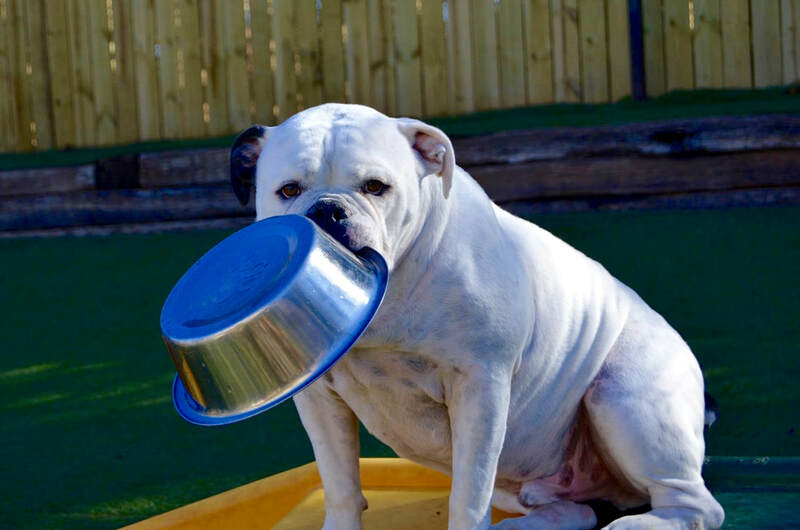 At Wag Atlanta, our daycare runs from 6am-10pm. Come play with us!